The internet functions as the master machine controlling human brain function creating a netocratic society and state. The internet exposure leads to low level EMF induced heme oxygenase induction in the brain. The brain heme is depleted leading to increase in ALA synthase and porphyrin synthesis. The porphyrins self aggregate to form supramolecular organisms called porphyrions. The porphyrin acts as a template for the formation of RNA viroids, DNA viroids, isoprenoid organisms and prions which symbiosed to form nanoarchaea. The nanoarchaea contain magnetite and are magnetotactic and can have quantal perception as well as low level EMF perception. This leads to more of brain endosymbiotic nanoarchaeal growth. The nanoarchaea are capable of methanogenesis which contributes to global warming. 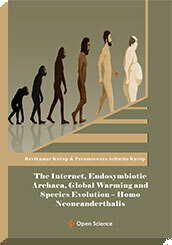 The global warming related to internet exposure can produce still further increase in endosymbiotic archaeal symbiosis. The growth of brain endosymbiotic archaea leads to a cerebellar dominant and frontal cortical dysfunctional brain with predominant quantal perception. This leads to generation of a new species- homo neoneanderthalis.